trainman7 wrote: Great to see GSV getting a much needed update! Interesting that the gated signals at Crossing St got WCH lights whilst the median signals got United Group lights! Noticed at Ulong St the WCH brackets are painted white They were painted on a few installations from around late 2015 to late 2016. Wonder why? Sure nice to see GSV doing some updates, hopefully there are some more coming for other areas. I wonder if those WCH brackets were painted white to look the same as the United Group ones? Maybe the new median signals at Crossing St were pre-assembled and were "new old stock", they would probably use fewer gateless signals these days with the shift to having gates on nearly all new installations. trainman7 wrote: Found some updated images of other crossings in the area with m-bells. It's nice that John Holland haven't rushed out and replaced all of their m-bells, but I guess we can expect a WCH e-bell to replace any that happen to die. 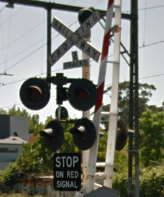 On a slightly different subject, I suspect that the current signals at Wingello were not new but recycled from the crossing at Fallon St, Albury. The signal bases at Wingello are dated March 2003, despite being installed in January 2008. The serial numbers of the bases are 0710 and 0711, while the crossing at Kembla Grange has bases with serial numbers 0712 and 0713 and are also dated March 2003. A check of the installation dates found in the LCSC report from 2004/05 https://www.transport.nsw.gov.au/system ... report.pdf shows that gated signals were installed at Fallon St, Abury in July 2004 and Kembla Grange in December 2004, and Fallon St is the only crossing to be installed around that time which has since been closed (in December 2006). The signals at Wingello also have Alstom lights and brackets which don't really fit with their 2008 installation date there, as United Group branding had begun to appear on new installations since 2006. Kembla Grange also had a Westinghouse hybrid bell when installed, same as Wingello, which explains why one of the hybrids at Wingello was replaced not long after being installed, as it would have already suffered some wear & tear while at Albury. The only missing piece of the puzzle is the fact that I can't find any pictures of the gated signals at Fallon St, they were only there for 2 years so were possibly not photographed very much! Hopefully John Holland leaves their m-bells/older signals alone for a while. At least the replacement e-bells are WCH! McK&H.Aust wrote: It's nice that John Holland haven't rushed out and replaced all of their m-bells, but I guess we can expect a WCH e-bell to replace any that happen to die. Well considering I found a picture of that crossing at the Olympic Highway, Gerogery (closed in 2006), there's probably someone out there with an image of Fallon Street! White Street now has new signals with WCH lights and e-bells. Princess Highway, Heywood (Mount Gambier Line). Nice find with the updated GSV images, google certainly have been busy! It's a shame about White St, Tamworth being upgraded, the m-bell there sounded nice and the signals seemed to be in good condition. I'm glad to have filmed it when I did, also noticed the new setup has 2 bells. Guess it's only a matter of time before they upgrade the other crossings, and the two pedestrian crossings with GRS semaphore mechs. That's good news about Wauchope still having the hybrid bell, I would have put money on it being replaced by an e-bell. Nice to know that the Portland Line crossings are untouched so far, fingers crossed! The crossing at Coramba certainly is an interesting one, wonder if it's a private road or something? McK&H.Aust wrote: Nice find with the updated GSV images, google certainly have been busy! I've found more, but unfourtunely they're all sad ones. Google recently went over most of the Echuca-Toolamba line crossings, which was brought back into service a few years ago. Predictably, they went ahead and replaced all the m-bells on the line! There were a lot of Teardrop bells, a few hybrid bells, a Safetran m-bell, and even a WABCO bell! Good to see the crossings on the Portland Line are untouched! I remember seeing a video of the crossing at Coramba and I am pretty sure it doesn’t have a bell! If you look at the 2008 & 2010 streetview images, you’ll notice that the crossings already had LED installed at them. Another you have to consider is that the line only went out of service sometime (I think) in 2008 or 2009, and brought back into service in 2013. I think the reason why they didn’t install new gated signals asides from the amount of traffic the line has was because the existing signals were still in good condition. Either way, you just know they were going to replace all the old m-bells. Makes me think I would like to film the crossing If I ever got the chance, as a Safetran Type 3 and WCH e-bell combo is fairly rare, also the signal in question has recycled cast iron counterweight arms which is interesting. Also noticed some GSV updates in the same area, the Cormorant Rd crossing on the Cargill Siding at Kooragang has had the hybrid bells replaced by WCH e-bells.